Looking for a pair of celebrity sunglasses without breaking the bank? These oversized fashion sunglasses are what KUKShades recommend! 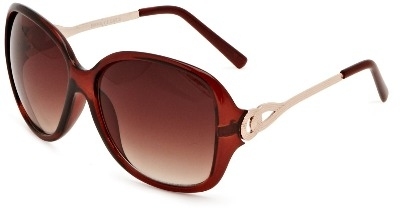 A stylish pair of ladies sunglasses with a simple round frame and a sophisticated loop detail on the arms. Whatever your style you are bound to create a bold impression, day or night. Will they suit me? This frame will suit most face shapes. Frames: Shiny brown plastic with golden coloured metal arms and brown covered tips.